Your lobby makes a great first impression with every touring family that comes through your doors. We’ve created a professionally designed poster that speaks directly to them--and tells them that you are committed to the highest quality care. 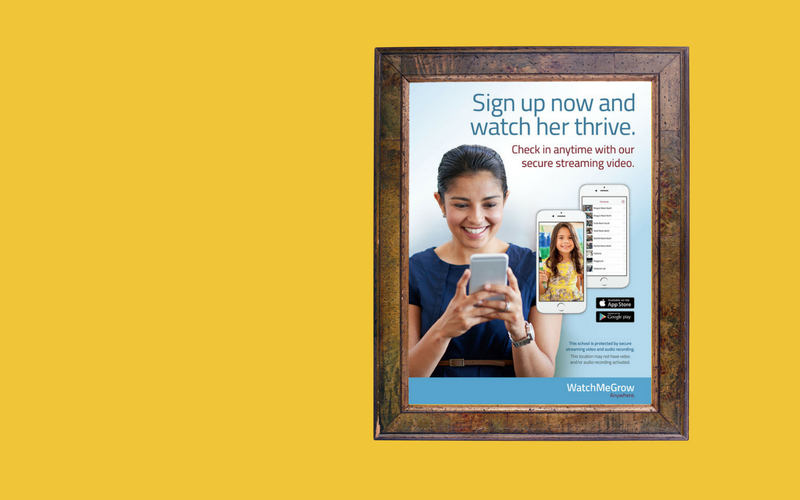 Let current and prospective families know you provide secure streaming video with this beautiful poster in the standard frame size of 18x24. Order your free poster today. You can find this poster and a host of other materials to help you market WatchMeGrow Streaming Video in our Marketing Toolkit. It has all the tools you’ll need whether you just installed streaming video or you’ve had it in place. Our toolkit includes free lobby marketing materials, handouts and FAQs for families and staff, and digital creative for use on your school’s website or Facebook page. If you’re not a WatchMeGrow school yet, contact us to find out how easy and affordable it is to offer streaming video to your families.